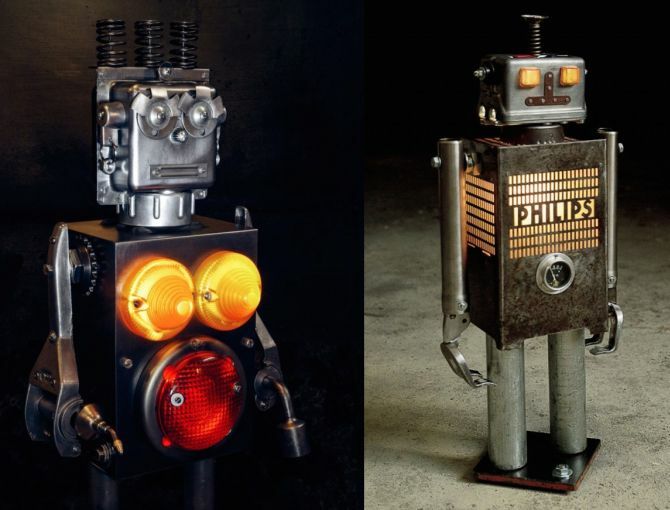 Paris-based graphic designer and artist, Bruno Lefevre-Brauer (a.k.a, +Brauer) gives second life to old mechanical parts by converting them into luminous robotic sculptures. 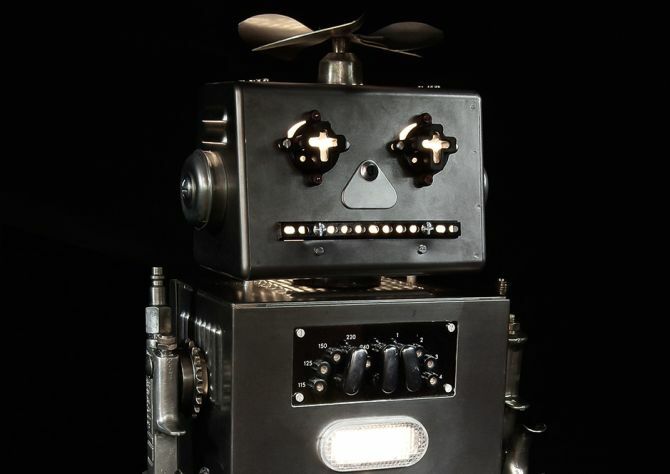 He has created a series of 14 handmade robot sculptures, which are entirely created using recycled industrial parts. Instead of working on technological features, +Brauer’s artwork emphasis on authentic and primitive forms of the robots. The artist has also given his each creation a unique name, such as Stanislas, Ernest, Cosmos 2001, Hector, and Romeo. This way each industrial golem possesses a true poetic personality of its own, along with distinct characteristics. Plus, no two robots look the same and are designed to appear different from the rest, just like humans in real life. To create these recycled robots with unique appearances, +Brauer has first sculpted their body and incorporated lights into their structure before assembling the parts together. 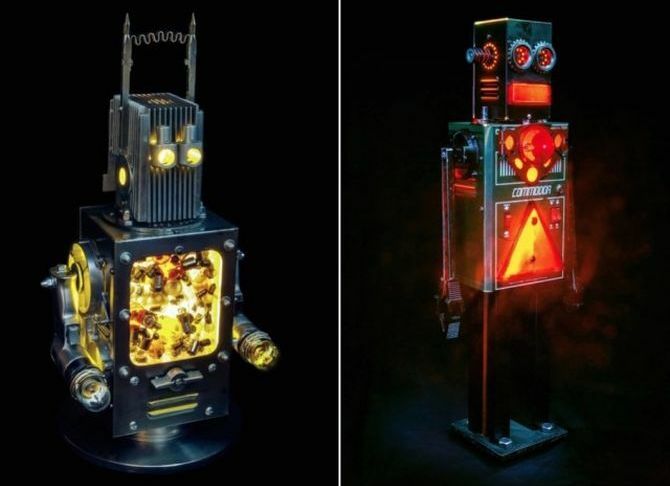 In daytime one can admire the beauty of these industrial pieces, but at night these mechanical agents turn into intriguing light fixtures to add industrialized ambiance into any mancave. Whether the lights are turned on or off, each robot is designed to beautifully interact with its environment in a distinctive way. 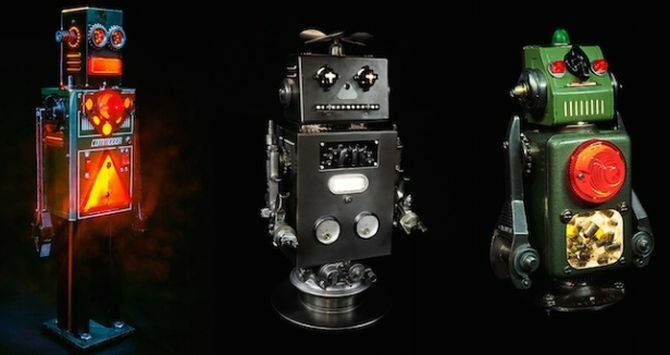 The intricate incarnation of the recycling robots has been showcased at Viva la Robolución!—an exhibition at M.A.D.Gallery in Geneva, Switzerland. The artwork identifies abandoned or forgotten metal and automation parts from workshops and garages, giving rebirth to one-of-a-kind statement pieces. Reusing old items has become a popular activity in the world of art and design. Breathing new life into forgotten objects is indeed a great way to bring environmental awareness among community, while creating some splendid illustrations.